More Trouble in the Pumpkin Patch! Take heed, Blackbirds! Beware the ghost of pumpkins past! so apt and colourful Cindy. Love the treatment too. Looks like the dark spirits are moving in as a mob. Cindy, love the 'ghost of pumpkins past' which has arisen with visible eyes, nose, and mouth. 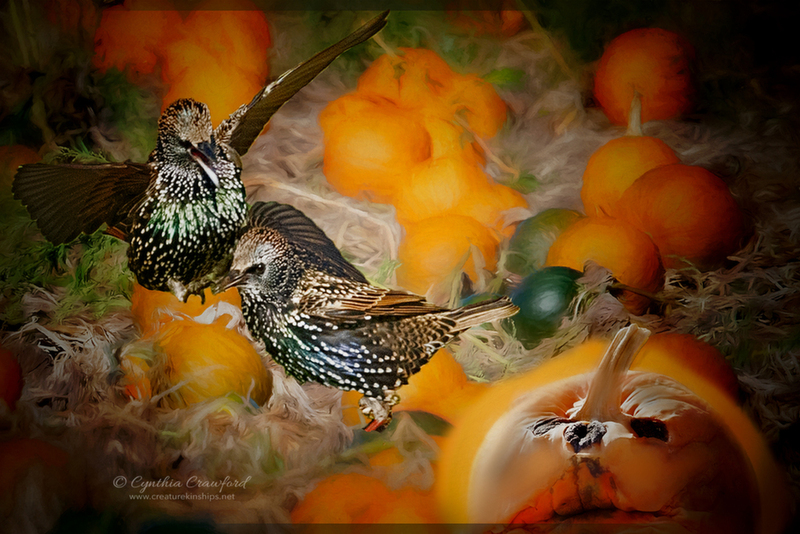 I have a feeling that the blackbirds are no longer welcome in the pumpkin patch. Great composite work, and the vignette is just perfect to showcase the main characters. I hope there is more to come in this wonderful Halloween mystery. These pesky starlings look just plain wicked! Perfect placement and eye keeping a watchful gaze on that ghostly, screaming fruit .......... Wonderful story telling work and love the glowing, golden pumpkins . Great stuff, Cindy!